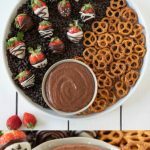 Chocolate Covered Strawberry Dessert Hummus is a healthy, sweet dessert option made with fresh strawberries, coconut sugar, unsweetened cocoa powder and chickpeas that all make for a delicious creamy dip. Chocolate and strawberries are a delicious flavor combination and chocolate covered strawberries are synonymous with Valentine’s Day. This dessert hummus is a play on this popular treat. 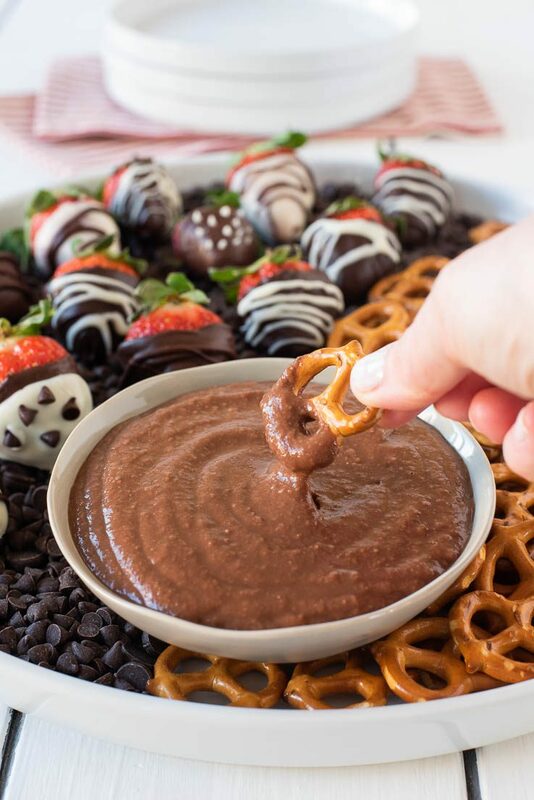 If you’re staying in for Valentine’s Day and cooking for your significant other, add this easy dessert to your menu, you’ll fall in love all over again. I’m bringing you this recipe with the help of Dole frozen sliced strawberries. The highest quality, all natural, non-GMO strawberries that come already sliced, so they blend up fast and easy. The frozen sliced strawberries come in 2 sizes, 14 and 48-ounce convenient, resealable bags. Hummus is made with chickpeas and so is this dessert. Not as strange as sounds, you don’t even know they are in there, but what they do is give the dip wonderful a creamy consistency without the need for dairy. With delicious strawberry flavor followed by a hint of chocolate, this hummus tastes just like chocolate covered strawberries that is not too sweet and oh so good with zero guilt. 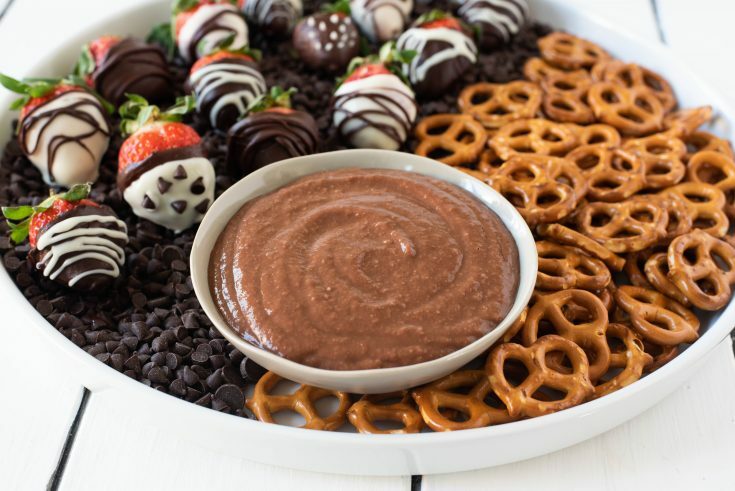 Is chocolate hummus good for you? With fiber, protein and vitamins from the chickpeas, vitamin C and antioxidants from the strawberries, minerals in the unsweetened cocoa powder, I would say this makes for a nutritionally packed dessert. Coconut sugar is now available in many large grocery stores and a delicious and healthier alternative to regular sugar. It is low on the glycemic index and if you’re not familiar with this sugar it has a slight, delicious caramel flavor. If you have kids, get them involved in making this dessert because you know if they help making it, they will love to eat it. It is also a great way to sneak extra nutrition into their diet. They think they’re just eating dessert, only you know the real nutrients that they’re eating. 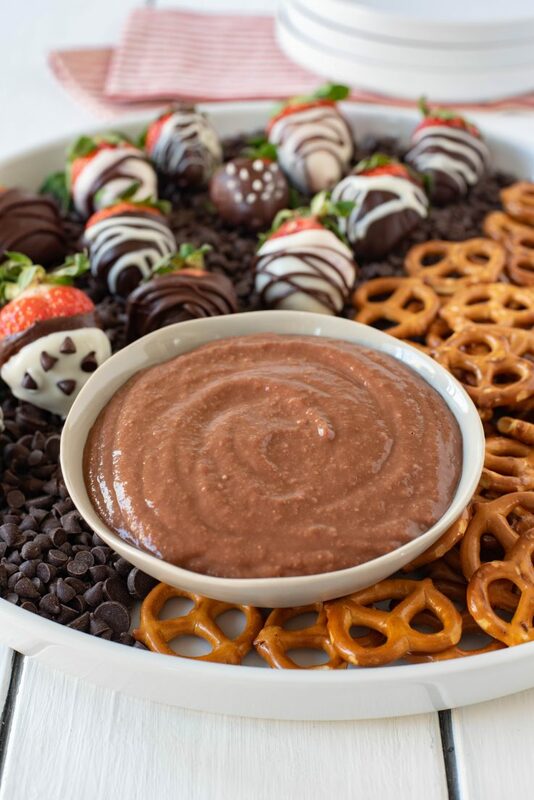 This Chocolate Covered Strawberry Hummus is best served at room temperature which makes all flavors are more prominent, but also can be served chilled. Serve with unsalted pretzels, sliced apples or any seasonal fruit of your choice. 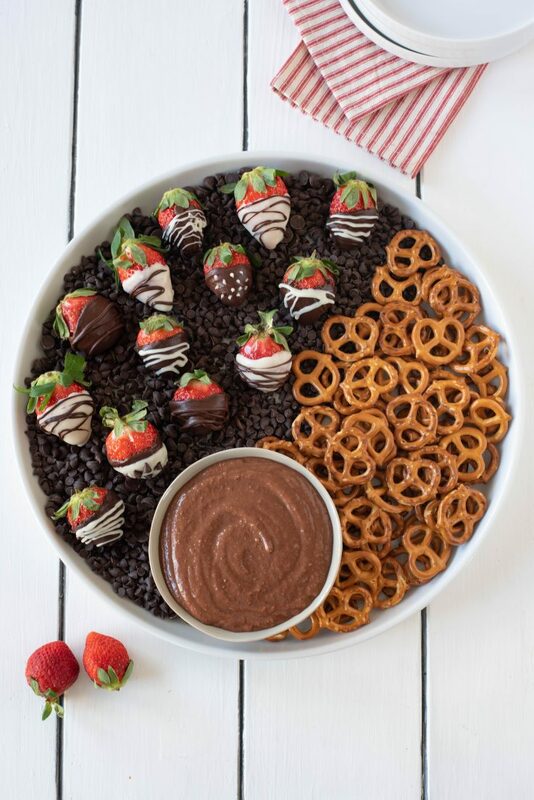 If you’ve tried this Chocolate Covered Strawberry Dessert Hummus or any other recipe on the blog, then don’t forget to rate the recipe and let me know it turned out in the comments below. I love to hear from my readers! If the hummus is too thick, add a little water until you reach the desired consistency.